In the midst of rubbish. Oh, my! Is that animal, vegetable or human-made object? There's a fruit on a tree which grows on the beach. At a certain stage it opens out into that flowery-looking thing. E.g. 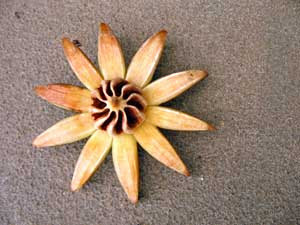 if the 'petals' were closed up they would form the round fruit.